Heavy rain and freezing temperatures add to the challenges facing refugee families on a Greek island. Emergency relief programs are currently being put in place by SOS Children's Villages. 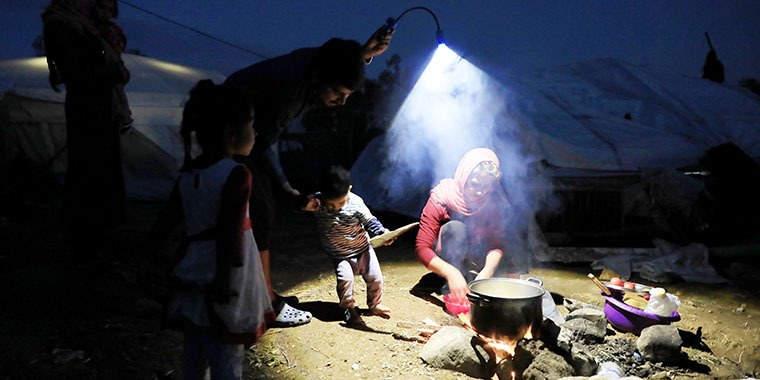 Recent cold and wet weather have added a new level of hardship for children and families living at the Kara Tepe refugee centre on Greece’s Lesvos island. In the following interview, George Protopapas, National Director of SOS Children’s Villages Greece, talks about the conditions at Kara Tepe, and the needs moving forward. What are conditions like at Kara Tepe? The biggest challenge that both beneficiaries and staff face at the moment are the extreme weather conditions on the island of Lesvos. Heavy rainfall and freezing temperatures during December and January, in combination with power cuts and leaks in the residential containers, led to an outbreak of colds and the flu, and sometimes hypothermia. Due to the difficult conditions, we have also noticed several cases of scabies and chicken pox, particularly affecting children. Even though a large number of children and families were able to be transferred to the mainland before the winter holidays, arrivals have continued. The weather is a concern now, but what are the longer-term needs? Kara Tepe continues to operate at maximum capacity – about 1,200 people, 800 of whom are children. The need for educational, psychological and social support for the children is more urgent than ever. As one of the two organizations at the Kara Tepe refugee centre with staff trained in the care of children, SOS Children’s Villages agreed to take over the responsibility of providing supplemental educational support for refugee children who attend public schools at the preschool, primary and secondary levels. The public kindergarten can support only 30 children of the 120 kindergarten-aged children at the refugee reception centre. We work with these children to prepare them for formal education. We also provide around 80 students with Greek lessons to help support them in school and give the children a better understanding of the public school curriculum. These children need support so they can stay in school, and by doing so we minimize educational and social exclusion. Unfortunately, we have reached our capacity and we have to keep a waiting list for new students as more refugees arrive on the island. Are the educational needs of all the children at Kara Tepe being met? SOS Children’s Villages Greece was recently asked by the Ministry of Education to support another vulnerable part of the population at Kara Tepe – children with disabilities. There is currently an absence of specialized support for children with physical and learning disabilities. As the team at our Child Friendly Space is qualified in supporting children with disabilities and a variety of educational needs, we are extending our support for children with special needs. We are working to coordinate with the Greek authorities and to provide space that is safe and accessible for all children in order to start accommodating those with special needs as soon as possible. 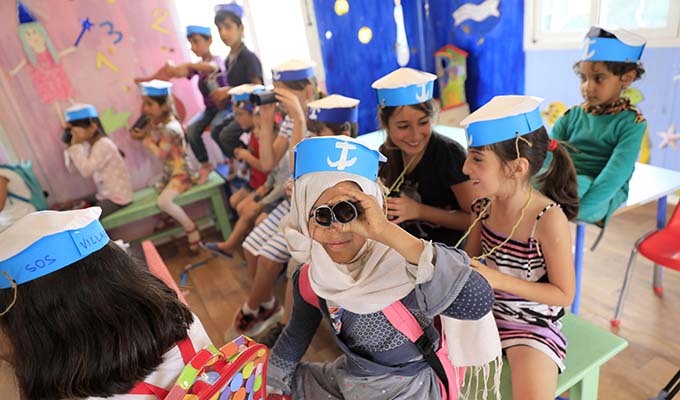 SOS Children's Villages Greece operates a Child Friendly Space at the Kara Tepe refugee reception centre on Lesvos island. The CFS provides educational, recreational and sports activities, reaching children ages four to 14. Of the 1,200 refugees at Kara Tepe, an estimated 800 are children. Learn more about our support for refugee children in Europe.